Wednesday morning crime scene investigators were looking for clues leading to the attacker who stabbed a 32-year-old man outside of the Luxor Market. Officials are appealing to the public for help. 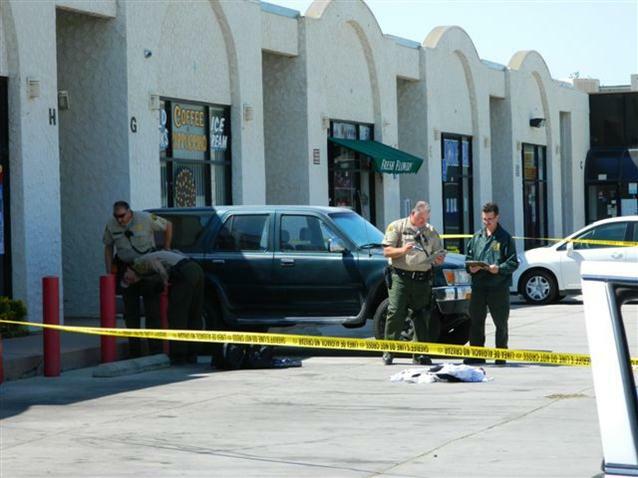 ANTELOPE VALLEY – Lancaster Station detectives are asking for the public’s help in identifying the assailant who stabbed a 32-year-old man outside of a Lake Los Angeles grocery store Wednesday morning. Shortly after 9 a.m., the Lancaster Station received a call about man who had been stabbed on 170th Street East near Avenue P, in front of the Luxor Market. 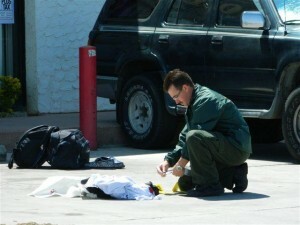 Photos courtesy of the Sheriff's Department's Lancaster Station. Rust said the 32-year-old man was stabbed an unknown amount of times in the upper torso and abdomen area and was bleeding out when he staggered into the store to ask for help. The man was airlifted to a local hospital and his condition is unknown, Rust said. Officials are not releasing the identity of the stabbing victim at this time and are still trying to identify the motive for the stabbing. Officials are asking anyone with information on this incident to contact the Lancaster Station at 661-948-8466. If you would like to provide information anonymously you can do so by calling Crimestoppers at 800-222-8477.